Possible showers, winds out of the southwest 40 mph and 2 degrees at the summit. Not a promising weather forecast for the summit of Mt. Rainier, Washington’s giant at 14,411’. But we were willing to seize the one 3-day weekend we had available for the summer while our daughter’s grandmother watched her, our house and our dog Emily. 6 of us (Doug, Courtenay, Scott, Rich, Vlad and Kathryn) headed for White River Campground Friday morning, June 22 to see if the weather forecast would surprise us and let us up to the summit of Mt. 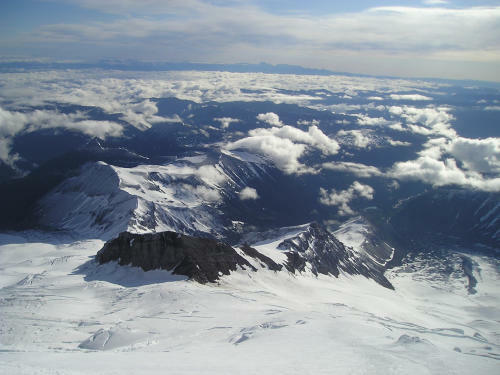 Rainier after all, via Camp Schurman and Emmons Glacier. We met at the ranger station by 9 a.m. where we asked for the latest weather forecast and checked on changing camp site reservations. 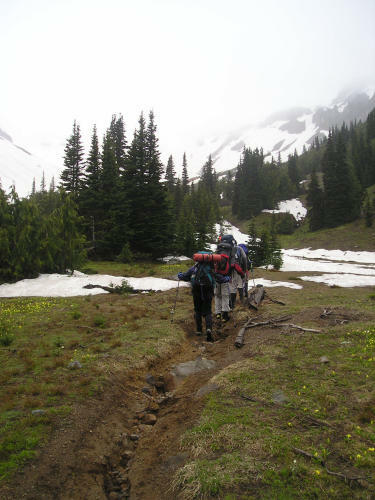 Our initial plan was to do a 3-day trip, camping Day 1 at 8000’ on Inner Glacier, camping Day 2 at Emmons Flats just up from Camp Schurman, and Day 3 summit, pack out and descend. I have done Rainier now 4 times in 2 days and twice in 3, and we guessed a 3-day trip might be more enjoyable for our friend Scott, who requested this trip as a 40th birthday present. 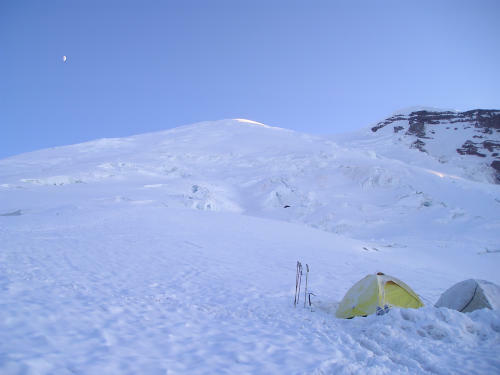 With Sunday’s weather forecast deteriorating, we requested two nights at Camp Schurman instead, to be as high as possible the first night in case day 2 looked better for a summit attempt than day 3. We were surprised to find only a handful of cars at the Campground parking lot. The ranger had told us a group of 5 had started up to Camp Schurman a few hours ahead of us, but I had expected more people on that side of the mountain on the summer solstice, The Campground was still closed for storm repairs, the weekend weather forecast was fairly poor, and it was a Friday morning, all of which probably explained the lack of people. We distributed group gear, optimistically slathered on sunscreen despite the clouds, chugged some water, and started walking toward Glacier Basin by 10:10. 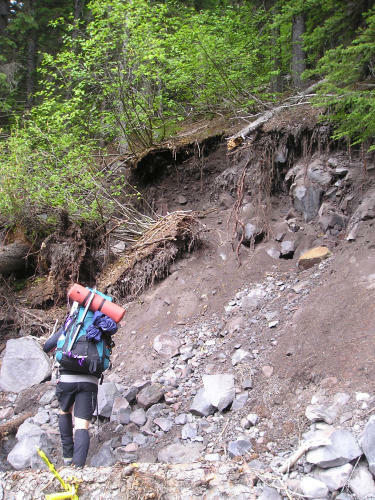 The route into Glacier Basin has changed dramatically since floods in November of 2006 caused tremendous devastation throughout the park. However, the detours are well marked with yellow “caution” banners along the way. 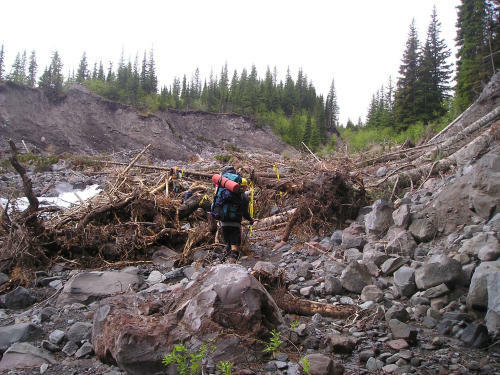 Traveling through the detours, washouts, log scrambles, erosion areas and boulder fields probably adds about 30-45 minutes to total time on the approach, making it far less accessible to day walkers in sneakers. 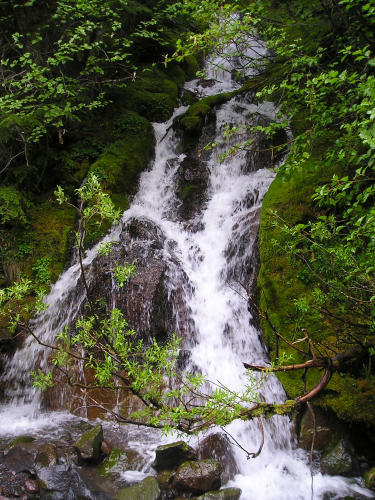 However, I personally found the added natural, raw feel of the washouts and obstacles to be more appealing, adding an element of beauty and remoteness that were not as evident on the trail before 2006. Once we reached Glacier Basin 2 hours later, we had a nice 45 minute lunch break, snuggled into down jackets and wind pants to make the deteriorating weather less invasive. We continued up the lateral moraine and roped up at the base of Inner Glacier about the same time 3 day-skiers approached on skins. 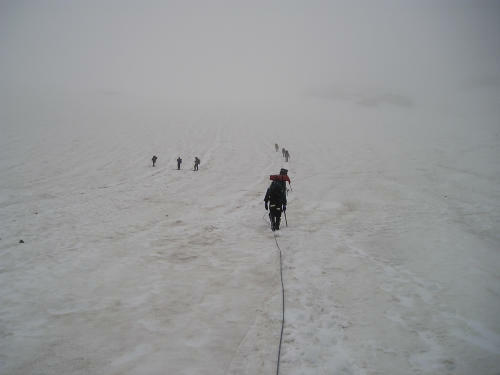 As we slowly made our way up the glacier, it started spitting rain and snow, decreasing visibility to 2 rope lengths. Traveling on a glacier in a white out for hours can be disheartening because every step looks just like the previous one, with no landmarks to gauge progress. I kept straining to see the familiar rocky landmarks that frame the Inner Glacier but all we had to go by was time and our altimeter. Around 9000 feet we heard shouts from one of the guys in the group of 5 that had left several hours before we had; we referred to them as Minnesota, since that’s where they were from. They had been up on the ridge for at least an hour unsuccessfully looking for the descent route from the ridge leading up to Steamboat Prow down to the glacier to go around to Camp Schurman. 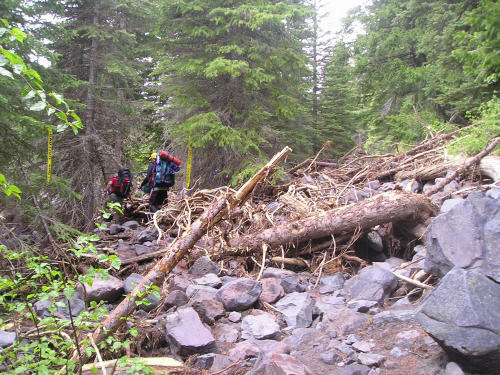 Once we reached the ridge and pulled out our maps, we determined that we had to drop 200 feet to gain the descent route. 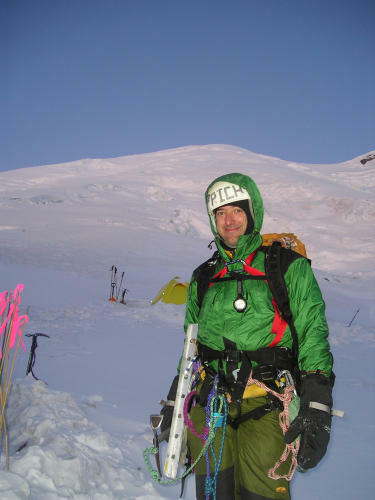 Scott was getting hypothermic from the mixed rain, snow and cold; Vlad was experiencing difficulties with the altitude; we were all getting low on water; and we had been going steady since 10 that morning with much of it in white-out conditions. It felt far more like a winter ascent than a climb on the solstice. With route finding delays and altitude issues slowing our party of 6 considerably, we crept into Camp Schurman close to 7 p.m. Only 2 other tents were set up when we arrived. As we began putting up tents, Mother Nature seemed to take pity on us and gradually parted the low cloud layer so we could clearly see the summit, the entire route up the mountain, and a glorious sunset above the clouds. After setting up camp, we all changed into what dry warm clothes we had left, then got to the very important task of melting snow and filtering water to drink or boiling for hot food. While we were at it, we kept commenting on how beautiful the sunset was and how clear it was above the cloud layer. A tiny sliver of moon was over the summit in one photo. 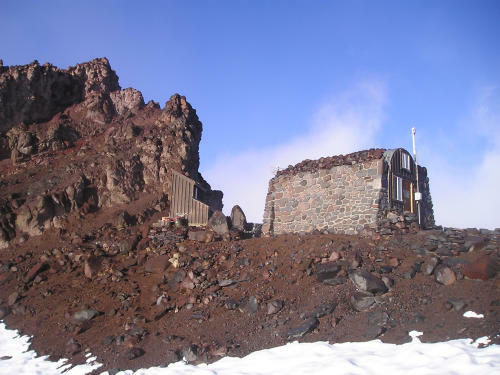 We talked with the ranger about the week’s trends of weather, and he said that it had been really nice and sunny about 1000’ up above Camp Schurman, so if we could get that far we might have a pretty decent shot at the summit. We felt encouraged that there was still a chance. Doug and I boiled water for hot cream of chicken soup and drinking water but really didn’t want more than that so late. We assessed how everyone was feeling and discussed options for the morning. Since Saturday’s forecast looked like the most promising for a summit, we asked who wanted to try it. 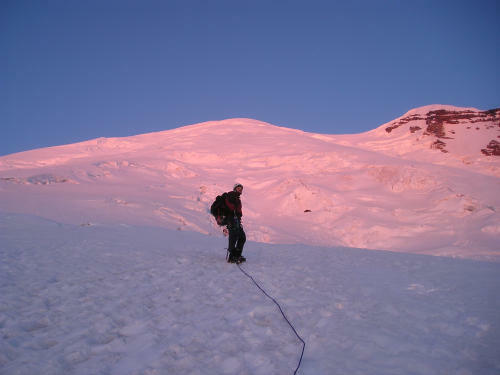 Usually on Rainier summit bids start around 12 or 1 a.m. in order to avoid snow bridges collapsing later in the day when the sun hits the upper slopes. With summit temperatures expected to be near zero and cold winds making it even chillier, we agreed that we’d check conditions at 4 a.m. and see who wanted to give it a go. The winds picked up in earnest about 8 p.m., blowing the new 1” of accumulated snow everywhere around us, coating our tents and gear in a fine powder that ended up freezing our ropes, boots, harnesses, boot laces – anything we couldn’t get into our tents with us. Once we all had replenished enough water and eaten something warm, we dove into down sleeping bags for an attempt at shut-eye near 10 p.m.
Night time winds sounded unrelenting, but it may have just been localized gusts against our tent that had been set up in a hurry and probably wasn’t very tightly secured. We all got a very poor night’s sleep, and at one point the flapping of the tent was like someone nudging me awake. Ear plugs helped dampen the roaring, but something bumping into me is another story. Another time I was awakened by drops of water splashing on my face and Doug nudged me fully awake saying it was raining inside the tent – apparently the blowing new snow from the previous day got caught in between the fly and tent, and with the wind gusts, that moisture went through the tent, condensed, and dropped onto us. We shivered through the night and wondered what we would do a second night if our down bags didn’t dry during the day. We slept in 30-45 minute chunks, if that, until Rich came over at 4 a.m. for a decision. When I got out to see what conditions looked like, I was surprised to see a well lit mountain, stars and moon, no clouds to speak of, and only gentle gusts that sounded far worse against loosened tent flaps than they actually felt. Once we got up and moving, we decided we had to give it a shot. 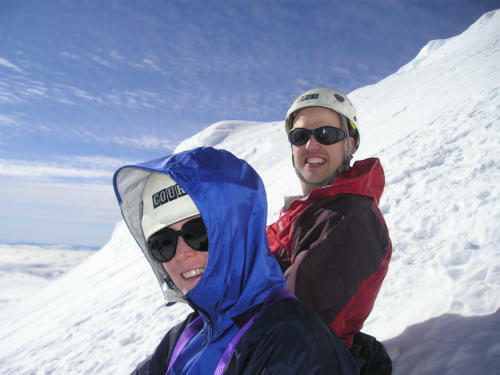 Vlad, Scott and Kathryn opted to stay in camp and hope for nice weather Sunday. In all 5 of my previous climbs to the summit, as well as numerous other unsuccessful attempts, departure time had been around 1 a.m. 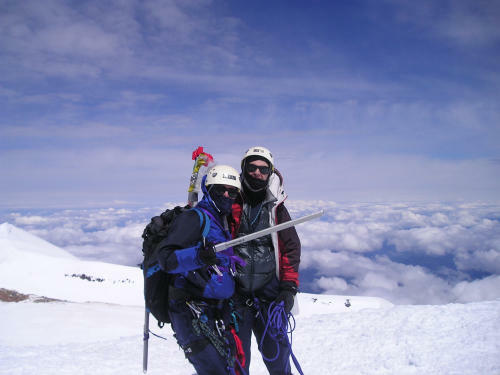 Given the temperature conditions, our late arrival the previous day (more time to rest is always better for acclimatization), and our camp reservation for a second night at Camp Schurman, we felt a later start would probably still work if the team was consistent and strong. As we assessed conditions we spotted one lone figure (hereafter dubbed Solo Guy) about an hour up the Emmons ramp, and we decided to go for it. Rich, Doug and I set out from camp minutes after 5 a.m. We were greeted by a beautiful cotton-candy pink sunrise and gloriously calm, welcome conditions given the previous day’s approach, and we made good time up the ramp. 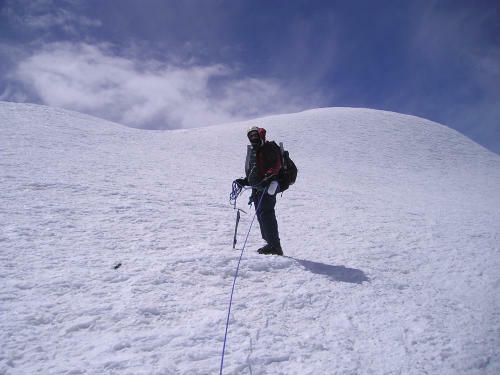 The first hour we ascended 1100’, took 10 minute breaks after every hour or so of walking, keeping steady pace behind Solo Guy, and as we reached the summit bergschrund the winds started to pick up significantly. Solo Guy was headed down as we started up the last 600 feet to the true summit. At 11:40 we stood at the top, 14,411 feet, leaning hard into 40 mph steady winds from the southwest, and every stitch of clothing on to protect us from temperature close to 0. Visibility was awesome, with a low sea of clouds all around, and views of Olympus to the west, Glacier Peak and Baker to the north, and a few tents on the far side of the crater rim where someone must have been camping. Other than Solo Guy an hour in front of us and the Minnesota team (rope teams of 3 and 2) about an hour behind us, we did not see anyone else on the upper slopes of the mountain. We could barely hear each other over the fiercely blowing wind, but after high fives and a few quick summit shots we raced toward the crater rim to see if we could find a rest spot out of the wind. No such luck. We headed back to the bergschrund, a huge gaping chasm of ice hanging over bare rock where the glacier begins and ice heads down hill. To see actual mountain, bare rock typically covered by feet of snow, up that high was a first for me. It looked like a great place to get out of the wind but envisioning thick hanging ice chunks giving way and squashing us was very unappealing. The winds chased us around the corner, so we rested just long enough to drink water, slurp some Gu, take off a layer and put on more sunscreen before continuing down. I was delighted that for the first time ever I had not gotten nauseous above 13,000’ and could actually chew food that high, though my carbs of choice at previous breaks had been vanilla Gu packets. As we descended we took a few breaks, every hour or so, and at 10,700’ we ran into our other three team members who were roped up for their own excursion for the day. 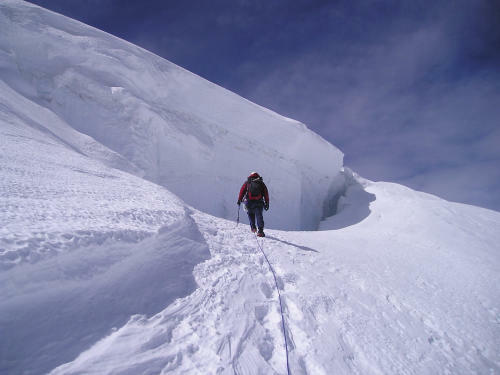 Our descent from summit to camp took less than 3 hours in hard snow conditions. Temperatures remained pretty low, which afforded us very few opportunities to plunge step, so by the time we got down our ankles and balls of feet/toes were pretty tender from all the angled, unforgiving hard snow walking we had to do. Our next decision: whether to pack up and leave, or stay another day to let the other 3 try a summit the next day. In the end, with weather deteriorating for Sunday and everyone tired from a poor night’s sleep Friday, we agreed to pack up and head for the cars. We broke camp at 5:10 p.m., freeing several good tent platforms for the scores of people just arriving in Camp for the weekend, and the trip out was short and sweet, taking only an hour to the base of the Inner Glacier from Camp Schurman (by that time the route back to the ridge and Camp Curtis was clearly visible, and temperatures had softened the Inner Glacier snow enough so that we could plunge step and descend rapidly). We reached the cars by 8:30 p.m. with another 1.5 hours of daylight to spare. The toughest decisions: 1) guessing what the weather would do and which day would be best to try to reach the summit for the most people in our group; 2) switching the climb from a leisurely 3-day to a more aggressive 2-day attempt, especially given our later morning start and very late arrival into camp Friday; and 3) deciding to try for the summit with only three teammates instead of all 6. 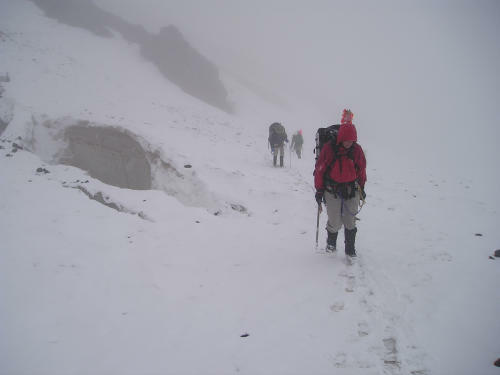 This trip, we were fortunate, as the weather was definitely deteriorating and temperatures dropping even as we broke camp. 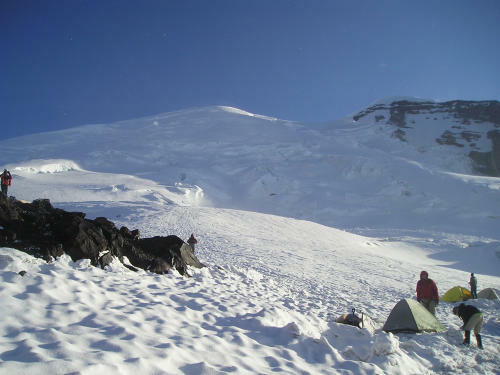 Most of the people at Camp were waiting to try a summit attempt on Monday, when the weather forecast improved significantly. 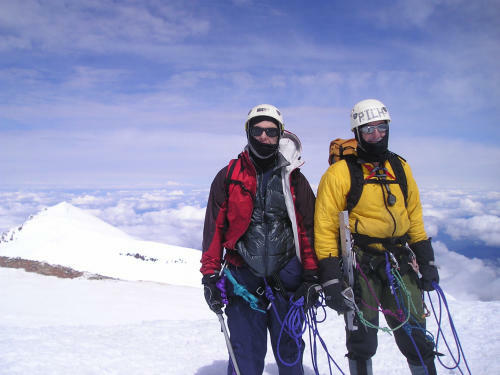 The biggest reward: feeling self-sufficient and strong as a steady-moving 3-person team, having the upper reaches of the mountain almost entirely to ourselves for a 10-hour climb. I’ve been on the Emmons route before when there are some 20 or more people lined up to proceed through “the trough,” and timing departure so that you stay just ahead of the mobs is sometimes challenging. 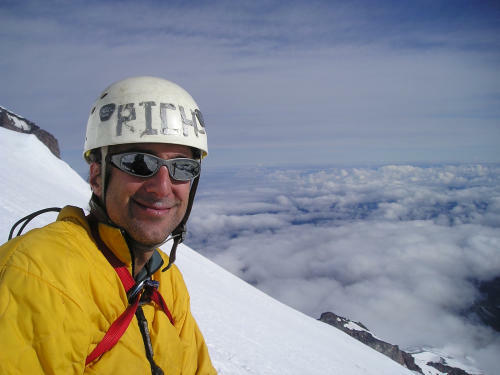 This summit trip had a welcome, unexpected, alone-with-nature aspect to it that I had not had an opportunity to experience yet on the usually crowded basic climbing routes up Mt. Rainier: Disappointment Cleaver (via Camp Muir) and Emmons (via Camp Schurman) routes. The things I would change: a) securing the tent better so the flapping would not keep us up all night; b) making sure everyone had a 4th day of wiggle room available in planning the initial trip so that everyone would have had enough food and free time to stay for another summit day if weather looked better; and c) keeping that 3rd day built into the climb so everyone could have more time to acclimatize. 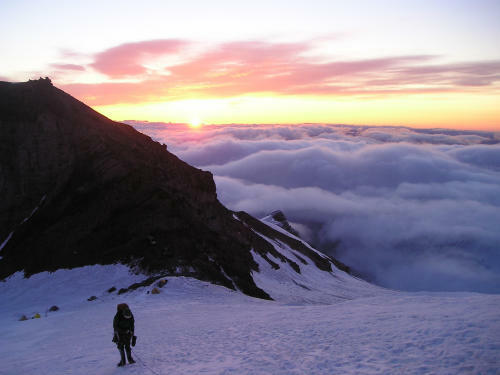 Yes, Rainier is doable in two or even one day, but success rates and climb enjoyment are that much higher if it’s a three-day trip. What I was most pleased about: group flexibility to accommodate weather and conditions to try to time the summit attempt the best we could for the most people possible. 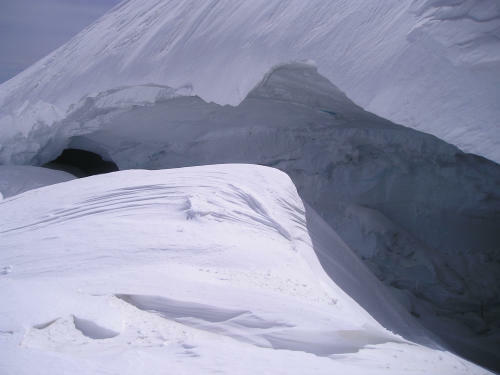 A very tiny taste of what it must be like on Everest, with its short weather window every year. 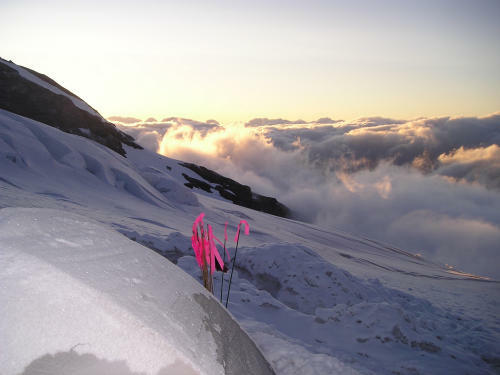 blowing snow coating tents (and everything else), sunset over sea of clouds at 9:45 p.m.
over Rainier with no clouds above 9,000' near 10 p.m.
Rich all tied in and ready to head out from camp at 5 a.m.
sunrise over clouds at 5:30 a.m.
Doug approaches summit bergschrund at 13,700' just 45 minutes to go to the summit!